Too often, from the women attending my Recovery Groups for Women with Controlling Partners I hear: "I don't think I should be here, I've never been hit." Or, "My husband isn't as bad as these other men." Or, "He's friendly to others, he just isn't nice to me." Or, "I really don't think I'm abused he's just hard to get along with." All these women, in time, came to see the coercive tactics embedded in their partner's behavior. But it wasn't until they saw the impact of their partner's behavior on their mental and physical health that they took their psychological abuse seriously. Only then, women felt that their abuse was validated. Why is that? The United States doesn't have laws that protect victims against coercive control or psychological abuse by a partner. Here, we have laws against domestic violence that only protect victims against physical violence--or the threat of violence. Even worse, it's only when victims fear for their lives that you can get protection. Evan Stark, an award-winning researcher and author of Coercive Control: How Men Trap Women in Personal Life, states, "Not only is coercive control the most common context in which [women] are abused, it is also the most dangerous." In the book, he argues that despite its great achievements, the domestic violence revolution is stalled, which reviewers say was "a provocative conclusion he documents by showing that interventions have failed to improve women's long-term safety in relationships or to hold perpetrators accountable. Stark traces this failure to a startling paradox, that the singular focus on violence against women masks an even more devastating reality. In millions of abusive relationships, men use a largely unidentified form of subjugation that more closely resembles kidnapping or indentured servitude than assault. He calls this pattern coercive control." Some countries are paying attention to the seriousness of psychological abuse by criminalizing it. In 2010, France became the first country to ban "psychological violence within marriage." One year ago last month, the United Kingdom passed The Serious Crime Act 2015 that makes it an offense to use controlling or coercive behavior in intimate or familial relationships. The UK's new law recognized a gap in the existing law and now includes patterns of coercive control by an intimate partner while still living together that can carry a maximum sentence of five years of imprisonment or a fine, or both. "This offence sends a clear message that this form of domestic abuse can constitute a serious offence particularly in light of the violation of trust is represents and will provide better protection to victims experiencing repeated or continued abuse. [...] It sets out the importance of recognising the harm caused by coercion or control, the cumulative impact on the victim and that a repeated pattern of abuse can be more injurious and harmful than a single incident of violence." Criminalizing coercive control conveys a strong cultural message in these countries: psychological abuse is not tolerated. Victims that may be attending domestic abuse recovery groups don't have to question or feel uncertain about whether to take their abuse seriously. Here in the US, we live in a culture that still empowers men more than women. Without a law criminalizing coercive control, our culture reinforces and condones it. In 2010, a survey by the Center for Disease Control, identified that nearly half of all women in the U.S. (48.4 percent) have experienced at least one form of psychological aggression by an intimate partner during their lifetime. Women identified verbal aggression in their partners as angry gestures that seemed dangerous, being degraded, insulted, or humiliated; or use of coercive control. Recently, I met with a woman who was informed by her lawyer that her severe psychological abuse during her 17-year marriage would not be considered during her divorce proceedings. Her husband even threatened her by saying, "If you don't go along with this, I'll ruin your life," to coerce her into taking on a large debt for him near the end of their marriage. Knowing that he would make good on his threat, she felt that she had no choice but to give in. Without a defense of coercive control that's recognized by the court, her ex-husband can continue his coercive control in a way that benefits him. The US doesn't yet criminalize coercive control, so what can we do to protect ourselves from it? For now, we can inform ourselves of what coercive control looks like from books, websites, informed doctors, and therapists--and take it as seriously as we would physical abuse. We can take care of ourselves and others by expecting respect and a sense of safety in our relationships. Carol A Lambert, MSW, is a psychotherapist and domestic abuse expert with decades of clinical experience helping individuals and groups. 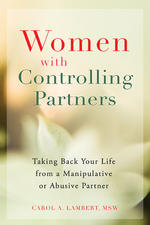 Based on her one-of-a-kind recovery groups, she is the author of Women with Controlling Partners: Taking Back Your Life from a Manipulative or Abusive Partner.